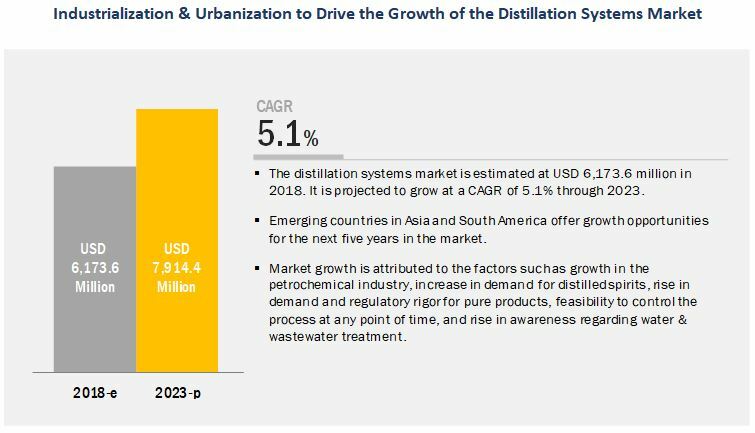 [192 Pages Report] The distillation systems market was valued at USD 5.94 billion in 2017; it is projected to grow at a CAGR of 5.1%, to reach USD 7.91 billion by 2023. The basic objective of the report is to define, segment, and project the global market size for distillation systems on the basis of component, techniques, type, industry, operation, process, and region. Other objectives include analyzing the opportunities in the market for stakeholders and providing a competitive landscape of the market trends, analyzing the macro and microeconomic indicators of this market to provide factor analysis and project the growth rate of the distillation systems market. The figure below shows the breakdown of profiles of industry experts that participated in the primary discussions. This report includes estimations of the market size in terms of value (USD million). 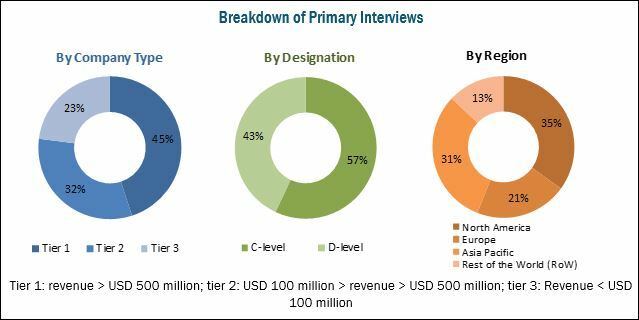 Both, top-down and bottom-up approaches have been used to estimate and validate the size of the global distillation systems market and to estimate the size of various other dependent submarkets. The key players in the market have been identified through secondary research (from sources such as press releases and paid databases, which include Factiva and Bloomberg), annual reports, and financial journals; their market shares in respective regions have also been determined through primary and secondary research. All percentage shares, splits, and breakdowns have been determined using secondary sources and were verified through primary sources. The key players that are profiled in the report include GEA (Germany), Alfa Laval (Sweden), SPX FLOW (US), Sulzer (Switzerland), Core Laboratories (Netherlands), PILODIST (Germany), Anton Paar (Austria), Praj Industries (India), L&T Hydrocarbon Engineering (India), EPIC Modular Process Systems (US), BÜFA Composite System (Germany), and Bosch Packaging Technology (Germany). 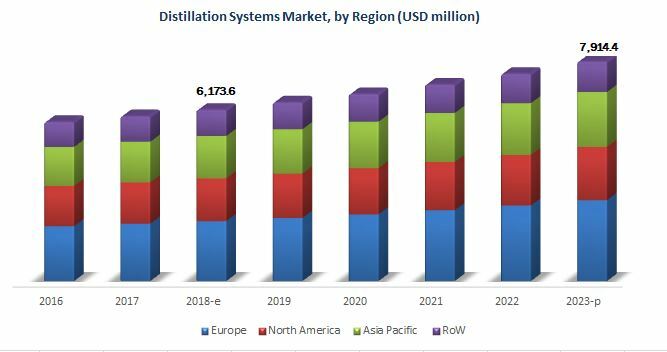 The distillation systems market is estimated to be valued at USD 6.17 billion in 2018 and is projected to reach USD 7.91 billion by 2023, at a CAGR of nearly 5.1% from 2018. Southeast Asia is a potential market for the distillation systems in various industrial applications due to the growth in the manufacturing sector in the region. The distillation process is used to separate the phases and obtain the pure form of the product. Imposition of regulations for pure products, including water, is projected to fuel the demand for distillation systems. Various R&D activities have been observed in the distillation systems market pertaining to the advancement of the technologies. The research institutes and companies engaged in distillation technologies have received substantial funding in the recent years for conducting R&D activities and technological advancements. Companies are focusing on investing significantly in the R&D activities to launch new products that can offer process efficiency to their clients. The distillation systems market, based on components, is segmented into column shells, plates & packings, reboilers & heaters, condenser, and others. The column shells segment is estimated to dominate the market with the largest share in 2018 due to the high cost of the components. This is followed by the plates & packings segment, as these are consumable components in the distillation systems and are used largely across industries. The distillation systems market, based on technique, is segmented into fractional, steam, vacuum, multiple-effect (MED), and others. The vacuum segment is projected to grow at the highest CAGR among all distillation techniques from 2018 to 2023. The technique is widely used for the separation of components, where chances of decomposition are high due to change in temperature and pressure. Vacuum distillation is commonly used for the separation of heavy hydrocarbon residues that are left during the atmospheric distillation of crude oil. Based on application, the distillation systems market is segmented into petroleum & biorefineries, water treatment, food, beverages, pharmaceuticals, cosmetics, and chemicals. Of the various applications, the beverages segment is projected to witness the fastest growth due to the high growth of the alcoholic beverage market. Distillation is an important process used in the manufacturing of alcoholic beverages, such as wine, beer, brandy, gin, rum, whiskey, and vodka. Although the continuous distillation process used in the manufacturing of alcoholic beverages dominates the market segment, the batch distillation process is also used significantly to manufacture alcoholic beverages with various flavors and different percentage levels of alcohol. The Asia Pacific market has witnessed robust growth in the distillation systems market. The Asian subcontinent is an emerging market, which is growing at a rapid pace. Desalination requirements, high consumption of alcoholic beverages, and the rising potential for industrial growth highlight the positive growth prospects in the region. Countries such as China, India, South Korea, Australia, and Japan are among the key manufacturing hubs in the region. Distillation system manufacturers are mainly focusing on expanding their presence in the Asia Pacific market through new product launches and expansions to strengthen their position. The growing R&D activities by governments as well as private organizations in the region is projected to drive the market growth. Technological advancements in Asia Pacific countries due to the development of infrastructure provides a potential scope for innovation in the production of distillation systems, thereby improving their cost-effectiveness and output. Distillation is regarded as a process with low efficiency due to high energy consumption. Hence, the economic burden due to the high energy consumption inhibits the growth of the distillation systems market. New product & technology launches, expansions, acquisitions, agreements, collaborations, and partnerships are the key strategies adopted by the players to ensure their growth in the market. Companies such as GEA (Germany), Alfa Laval (Sweden), Sulzer (Switzerland), Core Laboratories (Netherlands), PILODIST (Germany), Anton Paar (Austria), Praj Industries (India), L&T Hydrocarbon Engineering (India), EPIC Modular Process Systems (US), BÜFA Composite System (Germany), and Bosch Packaging Technology (Germany) have acquired leading market positions through their broad product portfolios that are specific to diverse end-user segments. The company is also focused on innovations and are geographically diversified.